Turn small end of beef under about 6 inches. Tie turned-under portion of beef with string at about 1 1/2-inch intervals. Place beef on rack in shallow roasting pan. Brush with oil. Sprinkle with pepper, marjoram and salt. Insert meat thermometer so tip is in thickest part of beef. Bake uncovered 40 to 50 minutes or until thermometer reads at least 140°F. Cover beef with tent of aluminum foil and let stand about 15 minutes or until thermometer reads 145°F. (Temperature will continue to rise about 5°, and beef will be easier to carve.) Remove string from beef before carving. Serve with classic mashed potatoes and your favorite steamed green veggie. A quality cut of meat, like beef tenderloin, doesn’t need much special treatment to make it taste amazing. In fact the less you do to beef tenderloin, the better it will be. This recipe calls for just the basics: olive oil, salt, pepper and a light dusting of marjoram, an Italian herb which is essentially a milder version of oregano. With this delicate treatment, you’ll end up with a savory roast that is tender — a true testament to the art of simplicity. Want step-by-step instructions? 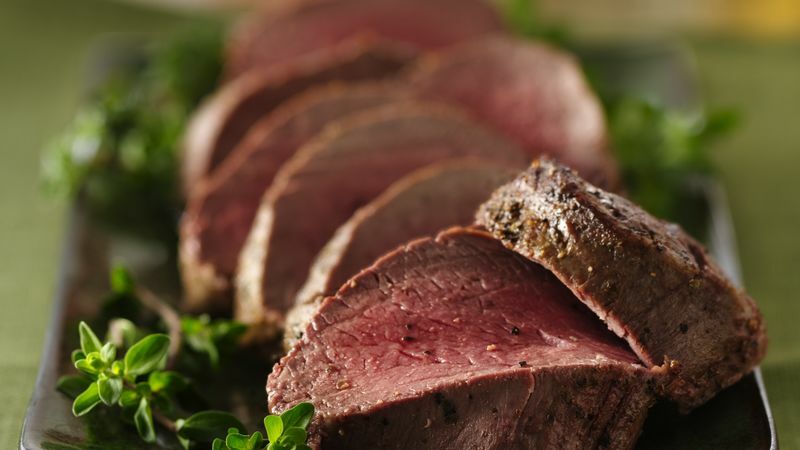 Check out Betty's article on how to make beef tenderloin. Don’t have beef tenderloin on hand? Check out Betty’s other beef recipes.